Monty Python’s Flying Circus was the eccentric and quintessentially English comedy show which ran from 1968 until 1974 and provided us with some of the most memorable sketches ever filmed. The six comedians involved were John Cleese, Michael Palin, Eric Idle, Graham Chapman, Terry Gilliam and Terry Jones – all now household names but it was Eric Idle who is most associated with Spamalot, the musical stage show based on Monty Python and the Holy Grail, one of the successful Python feature films. This online slot is a tribute to the stage show and it incorporates many of the elements from the production to give us an innovative and frequently funny game which should appeal to comedy fans and slots fans everywhere. 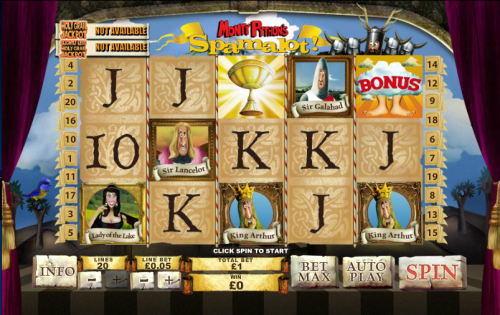 Everything about this Playtech slot is fun from the intro movie to the the bonus games but we’ll start with the symbols; the low value ones are the standard 10, J, Q, K and A but the higher value symbols are characters from the show such as the Lady of the Lake, Sir Galahad, Sir Robin, Sir Lancelot and King Arthur. The Holy Grail itself is the wild symbol, the Monty Python logo is the scatter symbol and there’s a bonus symbol featuring a cloud with feet sticking out of the bottom. Storm The Castle Bonus – The player must pick from six prize circles onto which the Knights will shuffle and reveal a prize; the French in the castle will fling a cow at you and if they hit the game is over. If they miss you continue. None Shall Pass Bonus – You get four attempts to chop a limb off the Ridiculously Brave Knight – hit him and receive a cash prize, miss and your multiplier (which starts at 5x) drops by one. Knights Who Say Ni Bonus – You must offer a shrubbery to the Knights who will tempt you with a cash prize for it; you can refuse it and try again three times before returning to the main game. Killer Rabbit Bonus – You must navigate your Knights in front of five rocks, behind one of which is a Killer Rabbit. To begin, chuck a grenade at one of the rocks and a Knight will cross, if you have hit the rabbit he (and all other knights) will cross safely; if not he will be eaten and you get to try again. You have six Knights to start with and each one that crosses safely will win a cash prize. Land three scatter symbols anywhere on the reels and you’ll get ten free spins; after each spin 1 – 5 wilds will be distributed onto the reels. 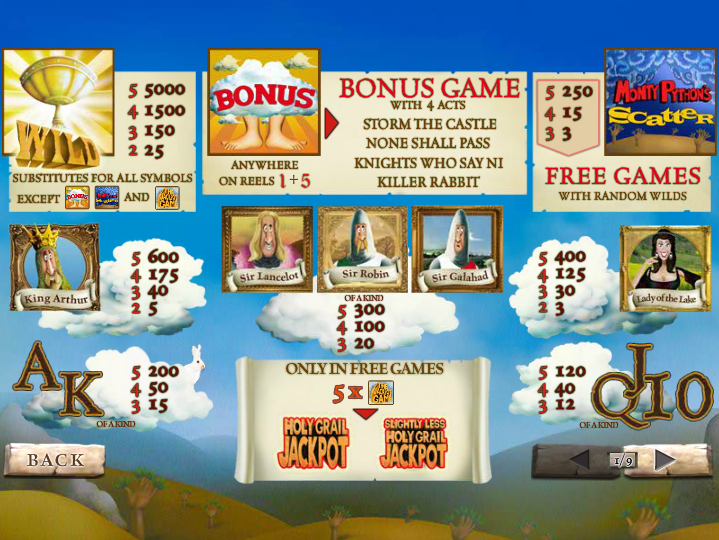 During the free spins you can win entry to the jackpot game by collecting five jackpot symbols. If you manage to collect those symbols you get a chance to win the progressive jackpot. You can do this by ascending six levels, picking position on the way up, however you may be squashed by a giant foot at any moment. 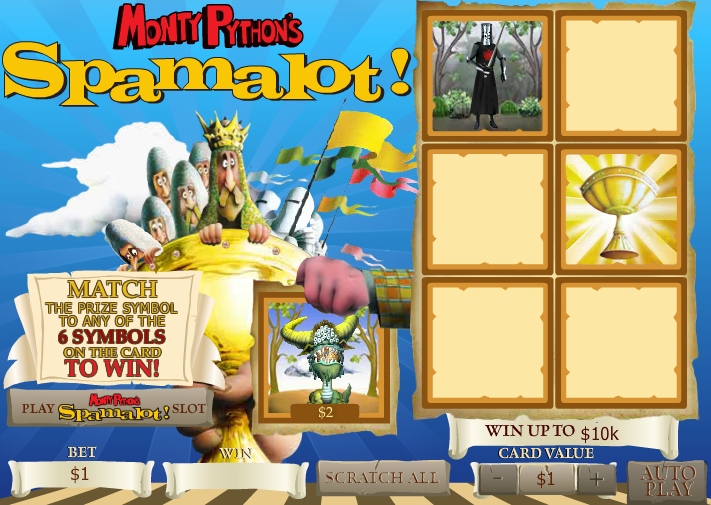 Spamalot is a great game and each bonus feature will be familiar to Python fans; there are of course elements of humour in all of them and die hard fans won’t be disappointed. It’s a game for all wallets with stakes of as little as £0.01 for one payline up to £20 per spin in total.